A predominantly DCU based Irish selection won all but two fights against their English opponents at a special charity fight night in London last week, with Ceire Smith, Shane Carter and Monaghan’s Stephen McKenna just some of the Irish emerging victorious in London. 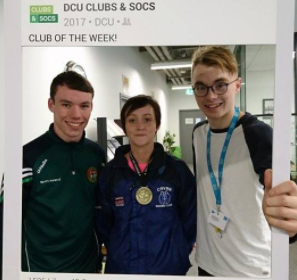 Team captain Smith, on her returning fight after 14 months away on placement in Australia, was delighted to return and represent DCU as she steps up her preparation for the Provincial and National championships. The Cavan native picked up a crucial victory over the 54kg English Champion at the 51kg weight grade on the charity fight night over the weekend of the 21st and 22nd of October. There were also comprehensive wins for Shane Carter and Stephen McKenna amongst an all-Irish DCU selection. “Representing DCU was awesome, I was team captain on the night. I was really honoured to lead the team parade to the ring, it was nice to be part of the team,” Smith said. “It was (tough) because I was fighting three, three minute rounds too, so it was a really good tester to go back in at an elite level and fight someone that standard and just see where I was at. Smith stated recently that she thought the team had made forward strides while she was away but is now adamant that the team have improved greatly over the last year. “Watching the guys train, I could see the difference but watching them box? I hadn’t seen them in a year you know, I’d say the English team were sorry they invited us over because they got hammered!” Smith joked. Returning to action has not been easy for the captain. Despite studying for her final year in Sports Science and Health, training, as well as working in Cavan over weekends, these burdens are something that are manageable according to Smith. “Some people say ‘Oh yeah it’s easy’ but I’m not going to lie, I’m in final year now and I’m finding it really really hard,” she said. “I’m not where I was after taking off 14 months so to get back here, even if I hadn’t got final year in the way would take a lot so it’s all about time management. After a year down under, Smith is hard at work in her final year here at DCU, but it’s only the beginning of her boxing career.